There are a couple of unusual things about United Driver Training’s new Isuzu FXZ 1500. One is it’s 10-speed Eaton constant mesh gearbox: it’s an increasing rarity to have crash boxes in new medium-duty trucks these days. The second unusual aspect is the Isuzu’s use as a driver training vehicle: you’re hard-pressed to spot brand new training trucks these days, in fact a lot of them are old bangers blowing a heap of smoke. 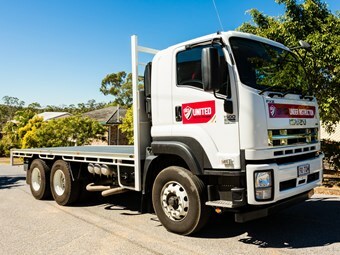 United Driver Training in Gladstone has recently bought an FXZ 1500 to train its heavy rigid license candidates, carrying concrete blocks on a tray body. Owner Adam Van Vegchel says he needed a reliable, cost-effective truck which could withstand the demands from learner drivers – in other words, take a fair bit of punishment. "Firstly, I needed a crash box, which is what the students need to learn in," Van Vegchel says. "I needed something which was strong and gave the students a realistic experience of what they can expect in the work force." "Of course a lot of new trucks sold these days are fitted with automatic and automated manual transmissions, but there are plenty out there that are manual and not all have synchro transmissions. "It’s like going for your car licence, being able to drive a manual provides a lot more flexibility. In the case of trucks, if you can operate a non-synchro gearbox then you can drive any truck, no matter the transmission as long as you have the correct endorsement." Van Vegchel opted for the Eaton RTO 11908LL, which he says hasn’t let him down. He says safety and driver comfort were also important considerations. The 24-tonne GVM FXZ 1500 has a 10 litre, 257kW (345hp) engine.